One of the major highlights of Governance Day at Social Media Week Lagos was the extensive discussion with Kaduna State Governor, Nasir El-Rufai. The event, which was hosted by USAID SACE and EiE Nigeria, was anchored by Tolulope Adeleru of Nigerian Info FM. Details of the interview below. Interview has been edited for brevity. How important has technology and social media been to your government? 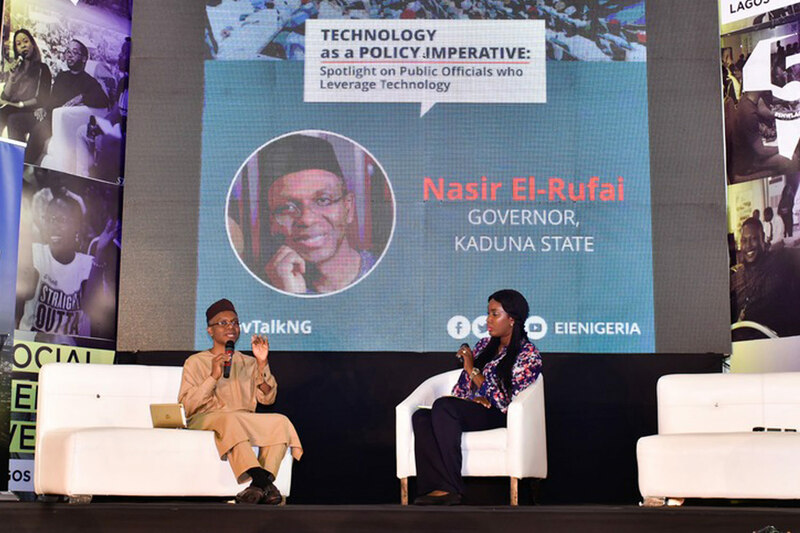 Governor El-Rufai: Technology is similar to pen and paper, it is a tool for human progress. It is important for the day-to-day management of public affairs, strategic planning and a powerful tool for achieving true democracy. Social media in particular made this possible. The use of ICT in government is still abysmally low, but there’s hope of improving on it. What do you think is responsible for the slow adoption of ICT in government? Governor El-Rufai: The fact that most public officers are old people who are slower to grasp ICT skills, many of them are 50 years and above. The average age of a civil servant in Kaduna State for example is 43 years. Out of the 25,000 civil servants in the employ of the State government, only 5,000 are ICT compliant. We need more young people in public service and the Kaduna State government is injecting new blood into the civil service. What is your administration doing to ensure adequate information distribution and transparency in government? Governor El-Rufai: First of all, people in government tend to think their job is to hide information, which should not be so. President Buhari signed the Open Government Partnership, and Kaduna State was one of the first States to sign it into law. My administration has leveraged tech tools to connect with the people. At the moment, we have partnered with BudgIT to drive the Open Budget Initiative. Virtually every information about our activities are online- job openings to ensure equal opportunity, white papers, laws and regulations published in the government gazette are also online. People are even allowed to visit project sites and report whatever they observe to the government. The five-year development plan for the State was outsourced and posted on social media for people to contribute on what they would like to see in their State in the next five years. What would you like people to know about the Southern Kaduna crisis? Governor El-Rufai: Contrary to what many think, the Southern Kaduna crisis is not caused by religion, but ethnicity. It involves two ethnic groups. It is also not a recent development, but one which dates back to 1980. The figures being peddled around about people who have killed are exaggerated. At the moment the government has been able to reduce the frequency of these killings. In the next 2 weeks, the Kaduna State government will publish a report detailing the genesis of the crisis for those who are interested to read it. Let me also use this opportunity to say that all those who are involved in the killings will be prosecuted. People who tweet and publish false news and pictures will also be prosecuted. There will be consequences for the irresponsible use of social media.